Commercial whale watching first started in California in 1955. Still until 1982, there were only 12 countries offering whale watching on a continuous basis, most of them within the USA and Canada. But already in 1992, 45 countries and territories provided commercial whale watching, and the number of whale watchers amounted to 4.5 million. In 1995, i.e. only three years later, there were 65 countries/territories and 5.4 million whale watchers. The diagram shows this steep increase during the 1990s (see graphic). 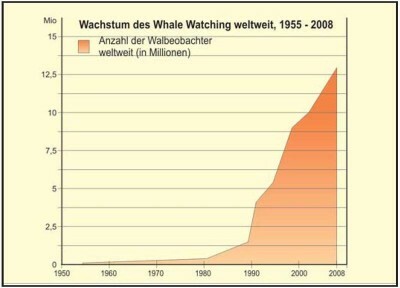 The last extensive survey of worldwide whale watching activities in 2008 showed that the development had continued unabated and that in many places a powerful industry has been established, employing an estimated 13,200 people worldwide and generating total expenditure of $ 2.1 billion. The average worldwide growth rate during 1991 to 1998 accounted on 12.1% per year. Some continents and nations showed growth rates of more than 200% in specific years. At a regional level, average annual growth has occurred well above growth in tourism rates in five of the seven regions in this report: Asia (17% per year), Central America and the Caribbean (13% per year), South America (10% per year), Oceania and the Pacific Islands (10% per year) and Europe (7%), evidence of strongly emerging industries. This made the sector the fastest growing branch of the tourism industry – and this boom is only slowing down moderately. Today, the worldwide growth rate is estimated to be 3.7% per year. The numbers of whale watchers had been estimated to 9 million in 1998 and in 2008, a total of almost 13 Million whale watchers were counted worldwide. Meanwhile the numbers of countries providing whale watching has risen to 119. At approximately 500 places around the globe it is nowadays possible to participate in whale watching offered by one of 3,300 operators worldwide. It became big global business with several billions of US Dollars profit each year.